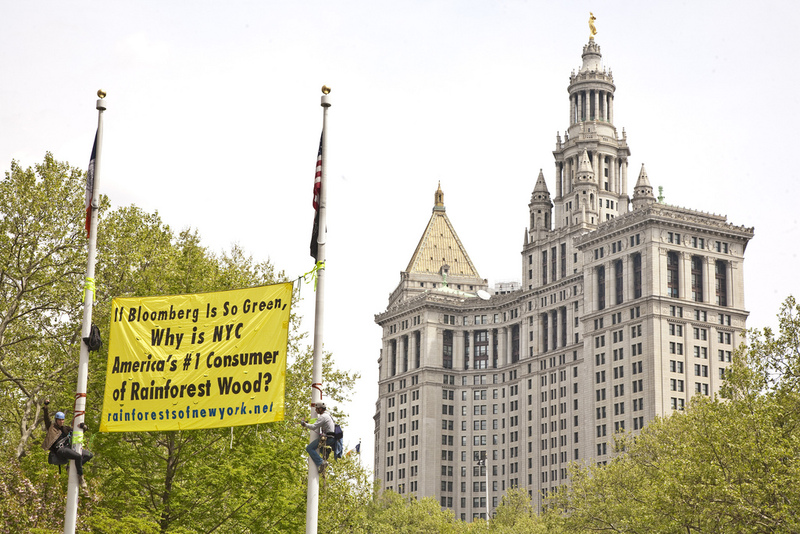 Climbers scale 40-foot flagpoles in City Hall Park and drop banner demanding an end to NYC’s use of tropical rainforest wood. Sites where the City has installed (or is currently installing) tropical timber include the decking of the Brooklyn Bridge, South Street Seaport, Battery Park, Fulton Ferry Terminal and Empire-Fulton State Park, fenderings and pilings at the Staten Island Ferry terminals, 12 ½ miles of boardwalk, Hudson River Park, Washington Square Park, and the High Line, tens of thousands of park benches throughout the city, and hundreds of miles of subway track ties. The benches at City Hall Park itself are made with wood industrially logged from old growth from the forests of the Amazon. 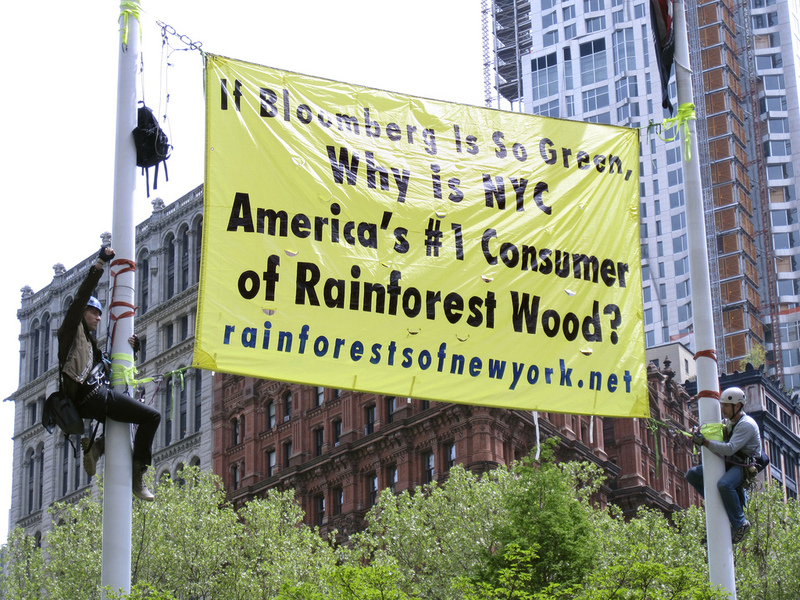 That was done by the previous administration, but under Bloomberg’s watch more rainforest wood is being laid down even today, during Earth Week. Some of these locations include Hudson River Park, the Coney Island boardwalk, Washington Square Park, and possibly the High Line. After intensive pressure by Rainforest Relief over the years, joined in 2007 by the NYCAG, the City finally acknowledged the problem. In 2008, at the United Nations, the Mayor announced his “Tropical Hardwood Reduction Plan,” which promised to cut the City’s use of tropical hardwoods 60% by 2020. According to many scientists, at current rates of destruction most of the world’s rainforests will be gone by then. According to the UN, an area of rainforest the size of Manhattan is destroyed every 3 hours. The two climbers were highly trained to perform this safe, non-violent action. 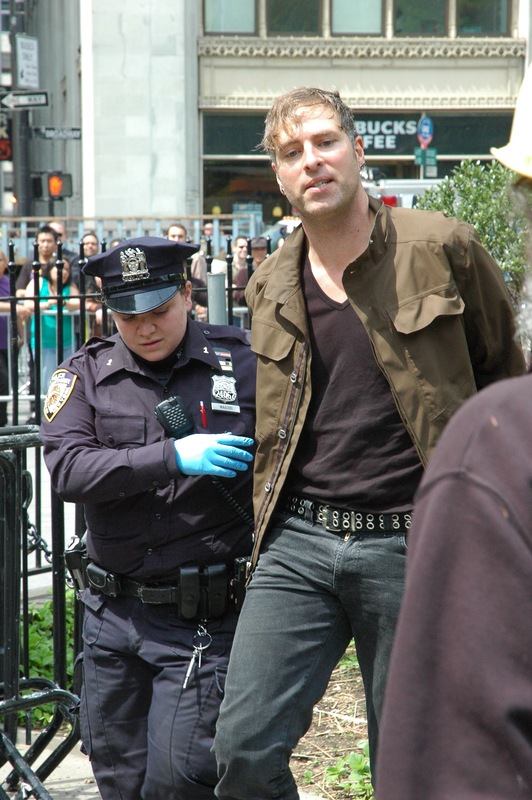 They were arrested and jailed overnight and now face charges that include obstruction of government administration, disorderly conduct and illegal posting of a sign. 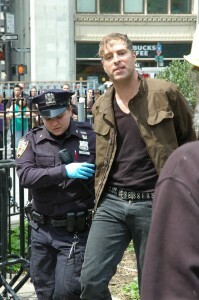 For more photos of this action, please see the Flickr page.